^ Saffir–Simpson Hurricane Wind Scale. National Hurricane Center (Miami, Florida: National Oceanic and Atmospheric Administration). 2013-05-23 [2014-09-28]. （原始内容存档于2014-09-25）. 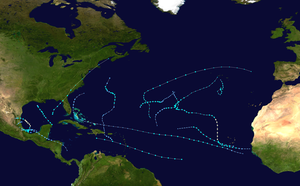 ^ 3.0 3.1 3.2 Background Information: The North Atlantic Hurricane Season. Climate Prediction Center (College Park, Maryland: National Oceanic and Atmospheric Administration). 2012-08-09 [2014-09-28]. （原始内容存档于2014-06-06）. ^ 4.0 4.1 National Hurricane Center; Hurricane Research Division. Atlantic hurricane best track (HURDAT version 2). United States National Oceanic and Atmospheric Administration. 2014-04-01 [2014-09-28]. （原始内容存档于2014-07-30）. ^ 5.0 5.1 5.2 Mark Saunders and Adam Lea. Extended Range Forecast for Atlantic Hurricane Activity in 2013 (PDF). London, England: Tropical Storm Risk. 2012-12-05 [2014-09-28]. （原始内容存档 (PDF)于2014-07-05）. ^ 6.0 6.1 Mark Saunders and Adam Lea. April Forecast Update for Atlantic Hurricane Activity in 2013 (PDF). London, England: Tropical Storm Risk. 2013-04-05 [2014-09-28]. （原始内容存档 (PDF)于2014-07-05）. ^ 7.0 7.1 Linda Maynard. WSI: Warm Tropical Atlantic Ocean Temperatures Suggest Another Active Hurricane Season. Andover, Massachusetts: Weather Services International. 2013-04-08 [2014-09-28]. （原始内容存档于2014-08-04）. ^ 8.0 8.1 8.2 William Gray; Philip Klotzbach. Extended Range Forecast of Atlantic Seasonal Hurricane Activity and Landfall Strike Probability for 2013 (PDF). Fort Collins, Colorado: Colorado State University. 2013-04-10 [2014-09-28]. （原始内容存档 (PDF)于2014-08-30）. ^ 10.0 10.1 North Atlantic Tropical Storm Seasonal Forecast 2013. Exeter, England. 2013-05-15 [2014-09-28]. （原始内容存档于2014-08-27）. 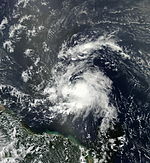 ^ 11.0 11.1 NOAA predicts active 2013 Atlantic hurricane season. Washington, D.C.: National Oceanic and Atmospheric Administration. 2013-05-23 [2014-09-28]. （原始内容存档于2014-07-10）. ^ 12.0 12.1 12.2 12.3 FSU's 2013 North Atlantic hurricane forecast predicts above-average season. Tallahassee, Florida: Florida State University. 2013-05-30 [2014-09-28]. （原始内容存档于2014-04-19）. ^ 13.0 13.1 13.2 William Gray; Phil Klotzbach. Extended Range Forecast of Atlantic Seasonal Hurricane Activity and Landfall Strike Probability for 2013 (PDF). Fort Collins, Colorado: Colorado State University. 2013-06-03 [2014-09-28]. （原始内容存档 (PDF)于2014-04-19）. ^ 14.0 14.1 14.2 Mark Saunders; Adam Lea. July Forecast Update for Atlantic Hurricane Activity in 2013 (PDF). London, England: Tropical Storm Risk. 2013-06-04 [2014-09-28]. （原始内容存档 (PDF)于2014-07-05）. ^ 15.0 15.1 15.2 Mark Saunders and Adam Lea. July Forecast Update for Atlantic Hurricane Activity in 2013 (PDF). London, England: Tropical Storm Risk. 2013-07-05 [2014-09-28]. （原始内容存档 (PDF)于2014-07-05）. ^ 16.0 16.1 16.2 William Gray; Phil Klotzbach. Forecast of Atlantic Seasonal Hurricane Activity and Landfall Strike Probability for 2013 (PDF). Colorado State University. 2013-08-02 [2014-09-28]. （原始内容存档 (PDF)于2014-07-27）. ^ 17.0 17.1 17.2 NOAA: Atlantic hurricane season on track to be above-normal. National Oceanic and Atmospheric Administration. 2013-08-08 [2014-09-28]. （原始内容存档于2014-08-27）. ^ Philip J. Klotzbach and William M. Gray. Extended Range Forecast of Atlantic Seasonal Hurricane Activity and U.S. Landfall Strike Probability for 2009 (PDF). Fort Collins, Colorado: Colorado State University. 2008-12-10 [January 1, 2009]. （原始内容存档 (PDF)于2014-08-22）. ^ 19.0 19.1 19.2 19.3 19.4 2013 Atlantic Hurricane Season. National Hurricane Center (Miami, Florida: National Oceanic and Atmospheric Administration). 2014-02-25 [2014-09-28]. （原始内容存档于2014-07-15）. ^ Brian McNoldy. What happened to hurricane season? And why we should keep forecasting it.... The Washington Post (The Washington Post). 2013-09-30 [2014-09-28]. ^ Ryan Maye Handy. Colo. State hurricane forecasts may end due to lack of funds. USA Today. Fort Collins Coloradoan. 2013-11-27 [2014-09-28]. ^ 23.0 23.1 Philip J. Klotzbach and William M. Gray. Extended Range Forecast of Atlantic Seasonal Hurricane Activity and U.S. Landfall Strike Probability for 2014 (PDF). Fort Collins, Colorado: Colorado State University: 2. 2014-04-10 [2014-09-28]. （原始内容存档 (PDF)于2014-08-22）. ^ 24.0 24.1 Dr. Jeff Masters. The Unusually Quiet Atlantic Hurricane Season of 2013 Ends. Weather Underground (Weather Underground). 2013-11-29 [2014-09-28]. （原始内容存档于2013-12-08）. ^ 25.0 25.1 25.2 25.3 25.4 25.5 25.6 John L. Beven II. Tropical Cyclone Report: Tropical Storm Andrea (PDF). National Hurricane Center (Miami, Florida: National Oceanic and Atmospheric Administration). 2013-08-22: 2, 7 [September 21, 2013]. （原始内容存档 (PDF)于2013-12-14）. ^ John L. Beven II. 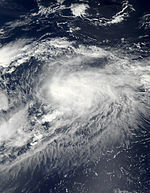 Tropical Cyclone Report: Tropical Storm Beryl (PDF). Miami, Florida: National Hurricane Center. 2012-12-12 [2013-12-04]. （原始内容存档 (PDF)于2013-12-04）. ^ 27.0 27.1 27.2 27.3 27.4 27.5 27.6 Stacy R. Stewart. Tropical Cyclone Report: Tropical Storm Barry (PDF). National Hurricane Center (Miami, Florida: National Oceanic and Atmospheric Administration). 2013-10-07: 2, 6 [2014-08-23]. （原始内容存档 (PDF)于2013-12-28）. ^ 28.0 28.1 28.2 28.3 July 2013 Global Catastrophe Recap (PDF). Chicago, Illinois: Aon. 2013. （原始内容存档 (PDF)于2013-10-29）. ^ 29.0 29.1 29.2 29.3 29.4 September 2013 Global Catastrophe Recap (PDF). Chicago, Illinois: Aon. 2013-10 [2014-09-28]. （原始内容存档 (PDF)于2014-09-24）. ^ 31.0 31.1 Atlantic basin Comparison of Original and Revised HURDAT. 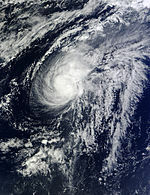 Hurricane Research Division; Atlantic Oceanographic and Meteorological Laboratory (Miami, Florida: National Oceanic and Atmospheric Administration). 2011-03 [2014-09-28]. （原始内容存档于2014-03-29）. ^ David Levinson. 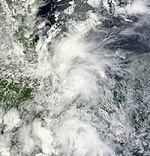 2005 Atlantic Ocean Tropical Cyclones. National Climatic Data Center. 2008-08-20 [2014-08-28]. （原始内容存档于2013-11-05）. ^ 33.0 33.1 Juan O. Tamayo. Tropical storm Andrea’s rains pummeled western Cuba. The Miami Herald. 2013-06-05 [2014-01-02]. （原始内容存档于2014-01-02）. ^ Remnants of tropical storm Andrea drench the Maritimes. The Canadian Press (Canadian Broadcasting Corporation). 2013-06-08 [2014-09-28]. （原始内容存档于2014-03-05）. ^ Mantienen alerta de precaución por lluvias de depresión tropical en Honduras. La Prensa (Tegucigalpa, Honduras). EFE. 2013-06-18 [2014-09-28]. （原始内容存档于2014-09-28）. ^ Daniel Ortiz. Hope Creek Gets Flooded Again, This Time Residents Ready. 7NewsBelize. 2013-06-18 [2014-09-28]. （原始内容存档于2014-09-28）. ^ Depresión tropical tira árboles y postes en Yucatán. Vanguardia (Mérida, Yucatán). El Universal. 2013-06-18 [2014-09-28]. （原始内容存档于2013-10-24）. ^ Depresión tropical en Yucatán: Inundaciones, accidentes y caìda de árboles y postes. En Progreso impacta rayo a la CFE. Artículo 7 (Merida, Yucatán). 2013-06-19 [2014-09-28]. ^ 41.0 41.1 41.2 41.3 41.4 Todd B. Kimberlain. Tropical Cyclone Report: Tropical Storm Chantal (PDF). National Hurricane Center (Miami, Florida: National Oceanic and Atmospheric Administration). 2013-10-08 [2014-08-23]. （原始内容存档 (PDF)于2013-12-28）. ^ Martinique: la tempête Chantal prive 33.000 foyers d’électricité. BFM TV. Agence France-Presse. 2013-07-09 [2014-09-28]. （原始内容存档于2014-04-13）. ^ Gary S. Votaw, Luis Rosa, Walter Snell, and Carlos Anselmi. 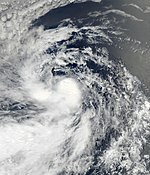 Tropical Storm Chantal (PDF). National Weather Service Office San Juan, Puerto Rico (San Juan, Puerto Rico: National Oceanic and Atmospheric Administration). 2013 [2014-09-28]. （原始内容存档 (PDF)于2014-04-13）. ^ Daniel P. Brown. Tropical Depression Four Discussion Number 1. National Hurricane Center (Miami, Florida: National Oceanic and Atmospheric Administration). 2013-07-23 [2014-09-28]. （原始内容存档于2014-07-14）. ^ 46.0 46.1 Daniel P. Brown. Tropical Cyclone Report: Tropical Storm Dorian (PDF). National Hurricane Center (Miami, Florida: National Oceanic and Atmospheric Administration). 2013-09-30 [2014-08-23]. （原始内容存档 (PDF)于2013-12-28）. ^ 47.0 47.1 John P. Cangialosi. Tropical Cyclone Report: Tropical Storm Erin (PDF). National Hurricane Center (Miami, Florida: National Oceanic and Atmospheric Administration). 2013-09-23 [2014-08-23]. （原始内容存档 (PDF)于2013-12-28）. ^ 48.0 48.1 Robbie J. Berg. Tropical Cyclone Report: Tropical Storm Fernand (PDF). National Hurricane Center (Miami, Florida: National Oceanic and Atmospheric Administration). 2013-10-10: 2, 5 [2014-08-23]. （原始内容存档 (PDF)于2013-12-14）. ^ 49.0 49.1 Fernand deja daños en 19 municipios de Veracruz. El Universal. 2013-08-26 [2014-09-28]. （原始内容存档于2013-10-14）. ^ 50.0 50.1 Henry Austin; Elisha Fieldstadt. Floods, landslides triggered by tropical depression Fernand kill 13 across Mexico. NBC News. 2013-08-26 [2014-09-28]. （原始内容存档于2014-06-05）. ^ Tropical Storm Fernand targets Mexico coast. Fox News. Associated Press. 2013-08-26 [2014-09-28]. （原始内容存档于2013-10-31）. 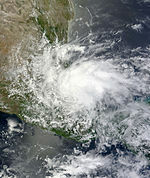 ^ 52.0 52.1 La tormenta tropical 'Fernand' causa al menos 14 muertos en Veracruz. CNN. 2013-08-27 [2014-09-28]. （原始内容存档于2014-09-17）. ^ 53.0 53.1 53.2 Lixion A. Avila. Tropical Cyclone Report: Tropical Storm Gabrielle (PDF). National Hurricane Center (Miami, Florida: National Oceanic and Atmospheric Administration). 2013-10-25 [2014-08-23]. （原始内容存档 (PDF)于2013-12-28）. ^ Michael J. Brennan. Tropical Storm Gabrielle Discussion Number 2. National Hurricane Center (Miami, Florida: National Oceanic and Atmospheric Administration). 2013-09-04 [2014-09-28]. （原始内容存档于2013-10-01）. ^ September 2013 Climate Report for Puerto Rico and the U.S. Virgin Islands. National Weather Service Office San Juan, Puerto Rico (San Juan, Puerto Rico: National Oceanic and Atmospheric Administration). 2013-10-10 [2014-09-29]. （原始内容存档于2014-04-15）. ^ Christopher W. Landsea and Daniel P. Brown. NHC Graphical Outlook Archive. National Hurricane Center (Miami, Florida: National Oceanic and Atmospheric Administration). 2013-09-06 [2014-09-28]. （原始内容存档于2014-09-28）. ^ 58.0 58.1 Richard J. Pasch. Tropical Cyclone Report: Tropical Depression Eight (PDF). National Hurricane Center (Miami, Florida: National Oceanic and Atmospheric Administration). 2014-02-04 [2014-08-23]. （原始内容存档 (PDF)于2014-02-25）. ^ Isabel Zamudio. Inundaciones en Veracruz, saldo de depresión tropical 8. Milenio. 2013-09-06 [2014-09-28]. （原始内容存档于2013-11-06）. ^ DF: hasta con lanchas atienden inundaciones. Milenio. 2013-09-08 [2014-09-28]. （原始内容存档于2013-12-13）. ^ 61.0 61.1 61.2 Christopher W. Landsea; Eric S. Blake. Tropical Cyclone Report: Hurricane Humberto (PDF). National Hurricane Center (Miami, Florida: National Oceanic and Atmospheric Administration). 2014-01-08 [2014-08-23]. （原始内容存档 (PDF)于2014-01-09）. ^ Lusa. Meteorologia Tempestade tropical afasta-se de Cabo Verde. Noticias ao Minuto. 2013-09-11 [2014-09-29]. （原始内容存档于2014-04-19）. ^ São Tomean authorities deny presence of “Rotterdam”. A Semana. 2013-11-22 [2014-09-29]. （原始内容存档于2014-07-14）. ^ 64.0 64.1 64.2 64.3 John L. Beven II. Tropical Cyclone Report: Hurricane Ingrid (PDF). National Hurricane Center (Miami, Florida: National Oceanic and Atmospheric Administration). 2014-02-05 [2014-08-23]. （原始内容存档 (PDF)于2014-02-25）. ^ 65.0 65.1 65.2 Redhum. 2013: México vive un año histórico en desastres naturales. ReliefWeb. 2013-12-25 [2014-09-29]. （原始内容存档于2014-04-07）. ^ El Coordinador Nacional de Protección Civil, Luis Felipe Puente Espinosa y el Subsecretario de Normatividad de Medios de la Secretaría de Gobernación y Vocero del Gabinete de Seguridad del Gobierno de la República, Eduardo Sánchez Hernández.. Mexico City, Mexico: ReliefWeb. 2013-11-28 [2014-09-29]. （原始内容存档于2014-04-07）. ^ WSPA Disaster Assessment and Needs Analysis: Flooding in Mexico (PDF). World Society for the Protection of Animals (ReliefWeb). 2013-09-30 [2014-09-29]. （原始内容存档 (PDF)于2014-04-07）. ^ Government of Mexico. Llevan Sedesol y Bancos de Alimentos productos a las zonas marginadas. Mexico City, Mexico: ReliefWeb. 2013-10-24 [2014-09-29]. （原始内容存档于2014-09-29）. ^ Entrega Cruz Roja Mexicana ayuda humanitaria a pobladores de seis comunidades en Pánuco, Veracruz. Cruz Roja Mexicana (Mexico City, Mexico: ReliefWeb). 2013-10-11 [2014-09-29]. （原始内容存档于2014-04-07）. ^ How cartels win with storm damage. McClatchy DC. 2013-09-28 [2014-09-29]. （原始内容存档于2014-04-07）. ^ 71.0 71.1 Stacy R. Stewart. Tropical Cyclone Report: Tropical Storm Jerry (PDF). National Hurricane Center (Miami, Florida: National Oceanic and Atmospheric Administration). 2013-12-23 [2014-08-23]. （原始内容存档 (PDF)于2014-02-03）. ^ 72.0 72.1 Todd B. Kimberlain. Tropical Cyclone Report: Tropical Storm Karen (PDF). National Hurricane Center (Miami, Florida: National Oceanic and Atmospheric Administration). 2014-01-08 [2014-08-23]. （原始内容存档 (PDF)于2014-01-09）. ^ Latest track shows weaker Karen making hard right turn. WESH TV (Orlando, Florida). 2013-10-06 [2014-09-29]. （原始内容存档于2014-04-19）. ^ Kathy Finn. Evacuations ordered as Tropical Storm Karen nears U.S. Coast. Chicago Tribune (New Orleans, Louisiana). Reuters. 2013-10-05 [2014-09-29]. ^ Kevin McGill and Stacey Plaisance. 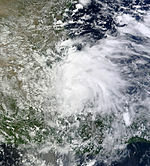 Karen threatens US during quiet hurricane season. Yahoo News (Braithwaite, Louisiana). Associated Press. 2013-10-04 [2014-09-29]. （原始内容存档于2014-09-29）. ^ Campbell Robertson. Gulf Coast Storm Pulls Federal Workers Off Furlough. The New York Times (New Orleans, Louisiana). 2013-10-05 [2014-09-29]. （原始内容存档于2014-09-29）. ^ Storm System Karen Dissipates Off Gulf Coast. The Weather Channel (New Orleans, Louisiana). Associated Press. 2013-10-06 [2014-09-29]. （原始内容存档于2014-09-06）. ^ 79.0 79.1 Daniel P. Brown. Tropical Cyclone Report: Tropical Storm Lorenzo (PDF). National Hurricane Center (Miami, Florida: National Oceanic and Atmospheric Administration). 2013-12-09 [2014-08-23]. （原始内容存档 (PDF)于2013-12-15）. ^ UK windstorm heads to northern Europe. Insurance Times. [2014-09-29]. ^ 81.0 81.1 John P. Cangialosi. Tropical Cyclone Report: Tropical Storm Melissa (PDF). National Hurricane Center (Miami, Florida: National Oceanic and Atmospheric Administration). 2014-01-22 [2014-08-23]. （原始内容存档 (PDF)于2014-02-03）. ^ 82.0 82.1 Eric S. Blake; Todd B. Kimberlain; John P. Cangialosi. Tropical Cyclone Report: Unnamed Subtropical Storm (PDF). 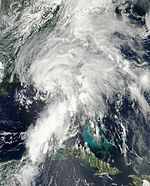 National Hurricane Center (Miami, Florida: National Oceanic and Atmospheric Administration). 2014-02-07 [2014-08-23]. （原始内容存档 (PDF)于2014-07-12）. ^ John L. Beven II. Tropical Weather Outlook (TXT). 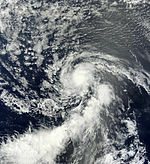 National Hurricane Center (National Oceanic and Atmospheric Administration). 2013-12-04 [2014-09-29]. （原始内容存档于2014-02-25）. 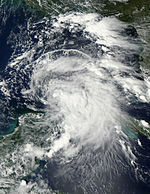 ^ Dean, Felix and Noel "Retired" from List of Storm Names. National Oceanic and Atmospheric Administration. 2008-05-13 [2014-09-15]. （原始内容存档于2013-08-07）. ^ WMO retires Ingrid and Manuel for Atlantic and eastern North Pacific basins. Silver Spring, Maryland: National Oceanic and Atmospheric Administration. 2014-04-10 [2014-09-29]. （原始内容存档于2014-07-24）. ^ August 2013 Global Catastrophe Recap (PDF). Impact Forecasting. Aon: 5. 2013-09-04 [2014-09-29]. （原始内容存档 (PDF)于2014-04-18）.